To contribute, go to the bottom of the page, join the page, and enter the password. It is probably easiest to edit sections individually with +Options —> "Edit Sections" at the bottom of the page. These slices are indexed with values 00-FF. That means in the original game there is a max of 255 "slices". There are about 30 completely unique characters (180 or so slices) and about 70 slices used for generic characters. The portraits must be 48×48 pixels. 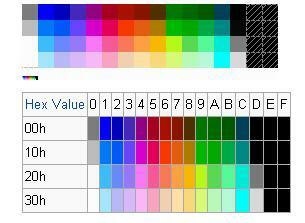 The parenthesis show the exact RGB color mapping. Also note that "WHITE" becomes whatever background color you choose for the character in DoaEditor. 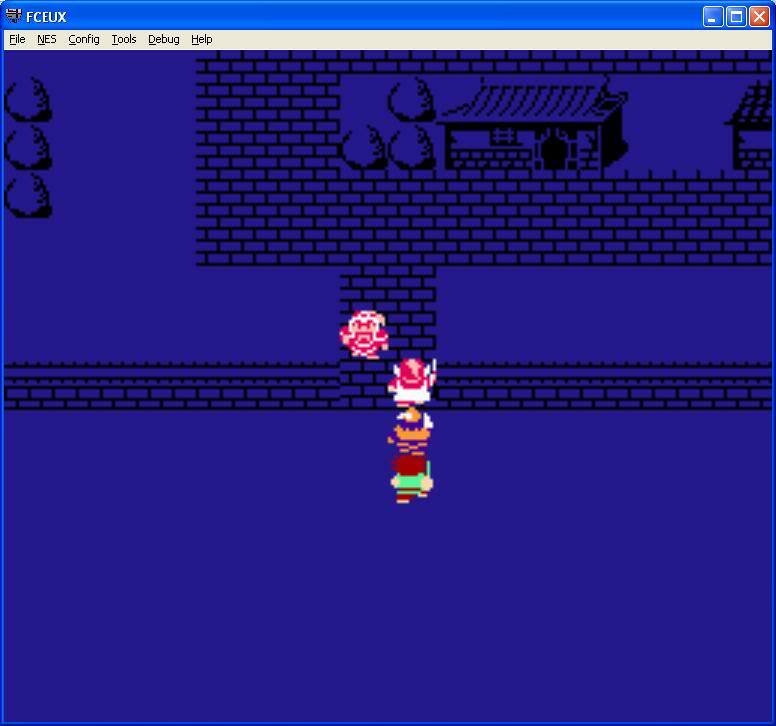 Put feidian in the Php folder and extract nes8 from tiles.rar and stick it in the Phptiles folder. Also put the rom in the Php folder for simplicity. OK so here's what we do next. Now you'll have a d2 bmp file. 5. Open your DoaE1 bmp and your DoaE2 bmp in paint. Zoom in on both. Cut your portrait from your DoaE2 bmp and paste it exactly over the DoaE1 portrait you are replacing. So for example you would cut DoaE2 Ji Ling and put him on top of DoaE1 Pang Tong. (Note that I painstakingly added backgrounds to some of the portraits in MS Paint using some of the DoaE1 original backgrounds). 8. Open Destiny of an Editor and change your general to the portrait you replaced. In this example it would be Pang Tong. It will look like Pang Tong in the tool but in the game it will be your new pic. *** If you want to use pics from other games, it can be trickier. Other NES games are fairly easy like ROTK1. You'll just have to pull the portraits out (either via screenshot or feidian) and change the colors to the blue/green/white/black format using the color codes I provided before by editing the palette in Infranview. 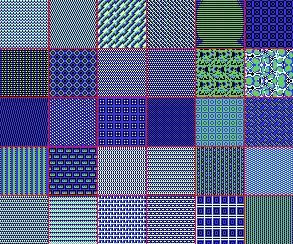 If the pic has more than 4 colors (pretty much all SNES portraits do) you'll have to "Diffuse" down to 4 colors in Infranview. 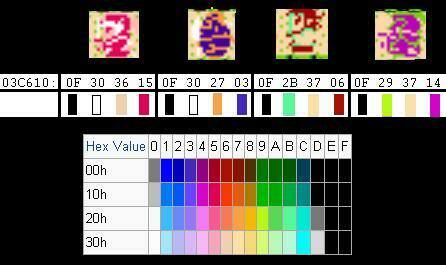 This could really mess up the pic if it's a SNES portrait or more complicated portrait because it uses more colors. However, you could always touch it up with MS Paint. It's not exact but close enough… If you want to see how it would look with a different color background change white to whatever background color. Then export this palette for later reference. Also note that anything that is white will use the background color you use in the DoaE tool. So if their eyes are white and you change the background color to purple their eyes will be purple (not good). To fix this either leave the background white or fill in the white colors in the portrait (besides the background). Use the latest version of "Destiny of an Editor" to expand your ROM (preferred method). Now you have a 1MB ROM. This allows us to add more portraits and other stuff! Now…a little about how the portrait system works. A portrait is made up of 6 horizontal slices. Each slice is indexed from 00 to FF and they are stored in 2 banks in the ROM at 0×8810 and 0xC810. The reason we could never have more than 255 slices before was because of this two character index system. In order to have MORE portraits we need a 2nd pointer, a place to put our new slices, and new code in the game to allow it to use our new banks. See the 2 "unknown" slots? We have never found any use for these 2 slots and it is likely that these were used for Japanese characters. I am using the 1st "unknown" slot for the 2nd portrait slice pointer. 00 = Use the original DOAE portrait banks. 2. The assembly part (nasty). OK for the short version, just open your hex editor and paste this into 0x7CFE4 and 0xFCFE4: "4C3083000000". You'd be pasting this over "10044980E6F1". That's all the magic right there. Essentially it has to figure out where to look in the ROM for the slice based on what the index number is and if that new bit is set. 3. Loading your portraits! Of course my preferred method is feidian. The two existing banks you'd load at 0×8810 and 0xC810. Note that any slice at hex:80 or above will go to page 2. A common error when using php and feidian is getting the "Php is not an internal or external command" error message. This is one of the most technical aspects of DOAE Mod editing and often one of the most frustrating, yet also one of the most rewarding once you get it correct! These are step-by-step instructions that will help you to get new portraits into your DOAE mod once you have "Php" folder with Feidian installed properly into it. If you were to go nuts with it you could load 340 unique portraits in a couple minutes if your bitmaps were ready. 4. Assigning a portrait to a general. Destiny of an Editor now allows you to pick your portrait bank with an expanded ROM! Follow these instructions to add 126 new sprite slots for a grand total of 210 sprites in the game. Likely more than you will ever need. 2. Load your sprites… This part can be a pain. The likely source of your sprites is going to be DoaE2. But the problem is the format is different. DoaE2 character starts facing sideways before he starts facing backwards. DoaE2 character is looking sideways in the wrong direction vs DoaE1. DoaE2 character's last sideways stance is the back not the front of the character (reverse from DoaE1). So…in order for you to get your DoaE2 portraits to work in DoaE1 you'll need to adjust the sprite to match the DoaE1 format then load it into your ROM. This will unload a whole page of sprites starting at 0xD010. You can put 42 sprites on each ROM page. 3. Assigning your new sprite to a general. The current sprites available are 00-53. If you have loaded pages 1C, 1D, and 1E with sprites then you can now use slots 54-D1. You can change the portrait background colors in DoaEditor for a general but you are limited to these colors right? Note that you can't change the "00 – No portrait color" but you can change all the others. Want to change "hot pink" to gray? Easy, just change the "15" in the hex sequence above to "2D". Want to change "clown barf" to an actual brown? Just change "18" to "08". 1. Open the ROM in your hex editor. 2. Load the doaetable.tbl from DoaEditor. 4. Change the town name as needed. Be careful about spacing! The other town names have pointers to them and we don't want to move them. You can edit the world map colors at the following addresses. Use the Palette to choose colors. Bear in mind that some tiles use the same colors, for example, grass spots and trees. $6011 = Map hierarchy (02 = inside a building). It uses that value to pull the place ID which in this case is 7E (Xu Zhou). Using that ID it looks at the data in $91A2 to $9221 to find the multiplier which is 0x391B2 to 0×39231 in the ROM. This explains why the prices are vastly different between Xu Zhou, who's multiplier is 01, and Jian Ye, who's multiplier is 0x40 (64). Want to edit what the shop keeper sells? Want to edit the price? Sure… First, you need to know the item codes. The list of items is on page 1. Searching for this string I find it on Line 0x390D0 in my hex editor. But what about the price? The item names and prices are all stored in the ROM at 0x2FAF0. 1. 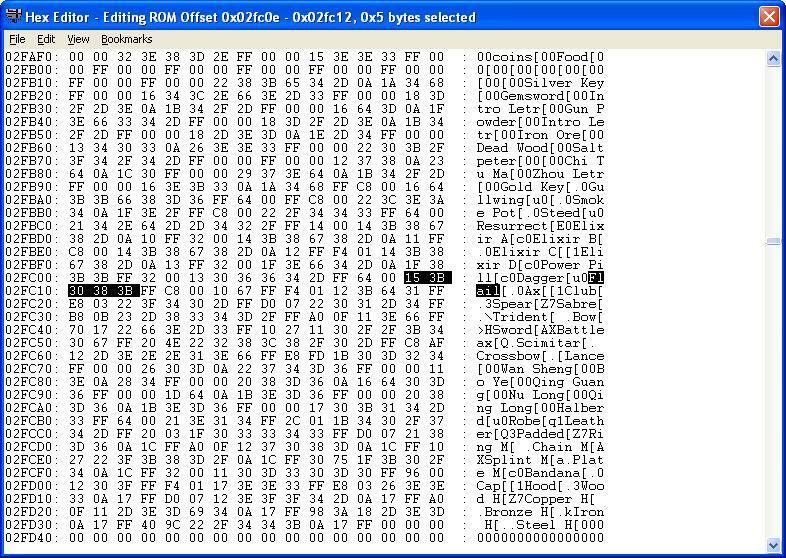 Use a hex editor that supports the "Load Table" feature. 2. 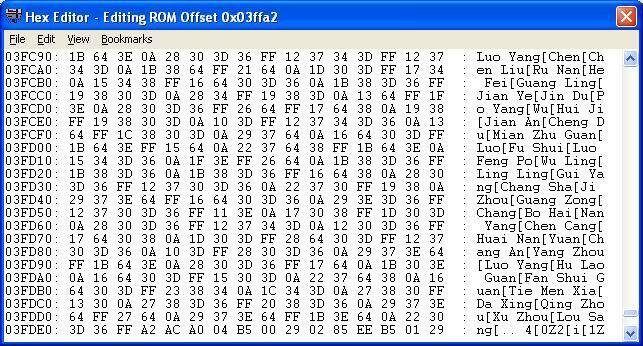 Open the ROM in the hex editor and load the doaetable.tbl from DoaEditor. The 4 characters before the item name are the price. For example the Flail is "64 00". These two entries are swapped. So it's actually 0064. Using your windows calculator in scientific mode you can convert 0×64 in hex and it is 100 in decimal which is the price of the Flail. Because there are 4 digits in the price the maximum price in the game is "FF FF" which is 65535. Note that you can also change the weapon and item names here too but be careful not to move other names because of the pointers. With this information you can turn Song Ren into a villager or turn a villager into Song Ren. Which essentially removes the Y1 position and produces a text bank number. Which again chops the Y2 value giving us 0x80 which enables the event (if it's set). C-F could also be used but they just repeat 4-7. Here are some known locations for villagers. MS Excel was made for this. Just make 50 rows (1 for each level) and put the above formula in using the different multiplier every 10 rows. Make sure your soldiers do not exceed 64k at end game. So using the formula, after 1 level, Huang Zhong and Guan Yu would have 114 soldiers while Zhao Yun would only have 112 soldiers. Remember that the level up multiplier will change every 10 levels. So for example, at level 11 Zhao Yun's multiplier would change from 1F to 22 meaning that he will start to gain soldiers faster. Now, as far as how many POINTS you gain for the TP, this is stored in a list of 16 entries, each which contains a number between 3 and 5. A random entry in this table is chosen and its number is how many TP you gained. Simply change the values in that table and you change the probabilities of how many tactical points you get on each level. Ever notice how you gained about 4x more experience points when you entered a new chapter? It's because of the formula for calculating experience, which is based off of the above list. Each officer's/rebel force's experience value is determined separately. The formula was arrived at via mathematics, not via code inspection, so it may be off, if ever so slightly. Events are things that happen in the game. For example when Liu Bei leaves and sits on the fancy chair. That is an event. Or when they build a bridge south of Gui Yang. An event controls that too… Events actually call to a specific part of the ROM to do something. For example, event 8822 is when Tao Qian asks you if you'd like to take over. Once you get into that event the code takes over and you lose Liu Bei… The "8822" is jumping to a part of the code. Namely A288. It's essentially "8822" flipped around where the first 2 represents the 3rd ROM section value (8 then 9 then A since the ROM part starts at $8000). So you can absolutely influence events by changing the numbers/letters but you have to know where we want to jump to. That's the tricky part. Event 1033 – Qing Long recieved! (Appears to work anywhere, just assure that the person you may give this event to has more than one line.) Note from sonic.penguin: You can actually use this to gain Qing Long after a battle. Event 152F – Coming to the rescue of Shu? Event 248E – From the one instance I experimented at the fellow seemed to sell only the Xuzhou items, maybe this changes depending on what Chapter Zone you are in? Worth more experimentation. Event 2D31 – Swordsmith going on about his masterpiece and need for ore. Event 2E2C – Jingzhou is at peace, stop Yuan Shao. (Odd? I thought you couldn't finish Jingzhou without defeating Yuan Shao? Event 4325 – Dong Zhuo is dead message? (Not sure what this does or who normally says it. Liu Bei? Event 482A – Zhuge Liang sleeping event. Appears to work nearly flawlessly, Zhuge Liang's sprite will appear where ever the X/Y ordinarily is supposed to. Unfortunately he runs off to Gui Yang. Event 4D27 – Yuan Shu trying to flee from his loss. If "No" is selected, Yuan Shu joins Yuan Shao for another battle. Event 4D2D – Someone tells party that Zhuge Liang has some info. for them. Event 5829 – Level Up! Event. Works perfectly. Event 5991 – Inn, doesn't seem that you ever have enough money when used outside of a real inn. Odds are though that the cost can only go to 65,535 gold. So if you want to make a really expensive inn… by all means. Event 642D – How peculiar… this is clear the actual "Recruit Zhuge Liang" event but… if an officer in an area were to join you anyway they join you instead. In fact testing this on Song Ren and Song Yong they can be recruited individually. How strange. This may have potential. Event 651E -Saving seems to work fine and it appears that castles are designated by Zones… it seems. At least in LouSang when I tried to invite Liu Bei it had told me that it was Tao Qian's castle. Event 6C34 – Sima Yi's death. Event 712E – Jingzhou finished trigger. Event 7831 – Some Wu Officers running away saying they'll have the final victory. Event 8029 – Defeating Yuan Shao and Shu for the final time. Event 902E – Pang Tong becomes a battle. Event 9433 – Sun Quan's death event. Event A12D – Zhang Fei gathering intelligence on Wu. Event A429 – Being pointed towards the Ma's. Event B08E – Well it's clear the Merchant format… but he continues to sell the Weapons from the value above. This doesn't make much sense all in all… maybe it depends on the NPC you attached it to? Event B327 – Buying the Silver Key (I think?) from the Merchant. The 4000 Gold is still required. Event B731 – I'm not sure who this belongs to. I'll paste the lines though and see if anyone recognizes them. You routed my men. In all my years of war, I[>] have never suffered such adefeat. I would[>]be honored tofight at your side if you'll[>]have me. [>][EVENT-B731] My guess is either Wei Yan or Huang Zhong, but the text has been jumping around a bit recently, so I'm not too sure. Event BD30 – Liu Bei declaring himself Emperor. Event C533 – Recruiting Jiang Wei . Just like the Zhuge recruitment this seems to be able to be used nearly anywhere. Event CD92 – Outside billeting appears to work fine and I guess that has potential for swapping officers out on the fly. Event E628 – Having two bandits join you in a tunnel? Event E62A – Cui Zhouping telling you he's already left. Event E724 – Wang Jin? Event E91C – Main recruit event. Event ED2E – If you ram into the door… speech. Event EE2A – Zhao Fan having you rest. If accepted it is the same case as the Ma and Yuan battle scenario as displayed earlier. Event FA20 – Liu Bei's warning to his troops about Yuan Shao. Event FA20 – Trigger for the majority of the Jingzhou battles. This instruction is found at 0x38bf4. I found where to change the Silver Key price. Of course you'd need to change the text in DoaEditor but this is the amount it will take from you wallet when you purchase the key. This probably only works in the “after battle” text. I haven’t tested it anywhere else. This feature is on top of the "Forced Officer Leave Events" feature. This allows for unlimited forced officer leaves and unlimited opportunities to bring officers back to life. These events have been tested and work in before battle text, end battle text, and when talking to townspeople. Note that if you use it in a town the screen will fade dark and come back and villagers might move around a bit as the sprites are redrawn. But with an officer leave event the targeted officer will disappear and with the alive event a new officer can appear on the screen if they are in that town. Be careful killing and reviving allies because if they were originally standing in a town waiting to be recruited, they will go back to that town waiting to be recruited again. 80- You can never meet this officer in random battles. 90- You can meet this officer in random battles, and you can recruit him after the battle. 98- You can meet this officer in random battles, but you cannot recruit him after the battle. C0- I think this means he's already been recruited. So each 1 is turning on and off some stuff. Officer leave is clearing all flags and officer alive is surgically putting 80 (10000000) back and retaining other flags. - If the officer was killed via the officer leave code and is brought back, he will not show up in random battles and will only have the "alive" flag. - If the officer was killed via other means and is brought back, he will be alive + whatever other flags he had. With all the caveats, if you plan on killing an allied officer and bringing him back, it's probably best to recruit him via some way that's not a talk to him in the town method. Otherwise when you bringing him back he'll be recruitable again from the same spot. Best way is to do this with either officers you have when you start the game or ones that come via a special event (like Pang Tong in the original game). it's the notorious mysterious "Smite Guo Si" bug. You know the one… if you were to cancel the leader's move in battle, it overwrote $6312 with "00". This has the effect of killing Guo Si and removing him from the game. "A678 A900 9D1362" -> "A91E 2082C4 EAEA"
Effectively, this subroutine was zeroing out something concerning officer orders. It is officer before the one that canceled that is affected by this subroutine. Of course, when we cancel the leader's orders, we zero out the value corresponding to the member who goes before him in battle… and that means "ff" gets added to the pointer where party orders get stored ($6213). So "00" is placed in $6312, which happens to be the status byte for poor old Guo Si. You just toasted him. The new subroutine checks for the "ff" value, and puts a "00" in there instead, thus saving Guo Si's life. I'd say he owes me now. And now Liu Bei stays. 0x312F8 from "A9" to some other general ID for Chang Sha. 0x3134A from "AA" to some other general ID for Gui Yang. 0x3AEB5 from "BC" to "FF"
Essentially changing Lu Bu's general ID to a non-existent one. Note that you can also change this to some other general ID and if you do, also change 0x36CA4 to that general ID for his little leaving speech. If you don't talk to a new general outside the castle make sure you still trigger [EVENT-7B2D] which kicks in the Zhuge Liang plot part. Every (active) soldier in your army is counted, and that total is divided by this threshold. If the value is less than one, then it becomes one. This is the amount of food your army eats every step on the map. This value is only calculated after a battle. That's why your army doesn't eat after leaving the first village at the start of a game (until you fight a battle). That translates to 300 (012C), 3000 (0BB8), and 30000 (7530). 0x34a00    1210 1F12 1E1C 0A12 1E63 620A 1B23 1363 | CAPCOM_CO.,_LTD. 0x34a40    0A1E 150A 101C 1421 1812 100A 181D 1263 | OF_AMERICA_INC. Note that I used the ~ character to render formatting bytes. 22E6 13    Capcom U.S.A., Inc.
2365 18    Nintendo of America Inc. The first two bytes above (like 21AB) are the values in the PPU table where the next line of text will begin to be stored. Every line on the screen is 0×20 bytes long. These byte pairs aren't exactly an (X, Y) pair… it's not that simple. Suffice it to say that most of you will want to write text on lines beginning with 21a0, 21e0, 2220, 2260, 22a0, 22e0, 2320, and 2360. The third byte (like 17) is much more understandable– it is how long the line is (23 characters). Fairly similar to how the Title Screen text is formatted above. The differences are that the length byte (#3) is OR'ed by 40… presumably used as a "fill" function by the DoaE engine. The fourth byte ends up being the "fill character". In this case, it is "0a", or a space. Simply change these general IDs to change the portraits displayed. The text is right after this section. To edit it use a hex editor and load the doaetable.tbl from DoaEditor. Then (carefully) edit the text while preserving line breaks. The breaks are usually a function like 20####. By default you start with the characters Liu Bei (A8), Guan Yu (A9), and Zhang Fei (AA). This lineup is stored at 0×35558-0x3555A (A9 AA A8). Change these to different general IDs if you want a new starting lineup. Note that in the opening sequence the first character (in hex) will use color palette 1 (Guan Yu), the second character (in hex) will use palette 2 (Zhang Fei), and the third character (in hex) will use palette 0 (Liu Bei). Not that this code equips daggers (01) and robes (14) to Guan Yu and Zhang Fei and equips the flail (02) to Liu Bei. Any other setup requires different code. You can change this around by playing with the code. To change the music of the game, simply replace the address with the hex values below. For example, the World Map music is located at address 3BF8F and has a value of 27. Change 3BF8F to 20 and the World Map music will play the Menu Theme. "Write Music 27 (Normal battle) to 00EA" Check logger, I get a couple of COMPARISONS! Look at the battle order, counted up from 00 in hex order, battle 36 and 47 are Sun Quan and Sa Ma Yi! There are six other comparisons at FF. Look in ROM for "36, 47, FF, FF, FF, FF, FF, FF" and found it at 0x3E1F7 (1MB ROM: 0x7E1F7 and 0xFE1F7). First using the cheat I found that 008A is where the temporary information was stored for how many spaces the smoke pot has left, so using 6502 I noticed it break when calling a value of "40" (64) was being written to. When I highlighted the screen to the left, it noted an offset "0x38C73" noticing that 38C71 was A9, which apparently in 6502 coder means something like "use value" or "replace value with" and a preceeding value was 40 (0x38C72), so I changed it to FF, loaded 'er all up again, and watched the value at 008A go to 255, which is what I wanted. So for example if you change 0x38C72 to 80 you double the timing of the smoke pot. If you change it to 20 you cut it in half. So once it sees "FF" it stops reading the list. Here's a rundown of the icons that you will receive. Then for the first character in each name, plug in the text value. For example if you wanted to call Lian Huo "Fire" you would use the fire icon "5A" in hex (left side) followed by the word "Fire" in ascii (right side). The palette changes depending on where you are so the text colors can change. To find out which palette it is using open the PPU viewer and you'll see groups of 4 colors. Mouse over each color to see the number then look in the ROM for that pattern of 4 numbers. Then you can change the text color but that may also affect the surroundings in the area you are in. Note that I think the text color is always the 2nd (white) and 4th color in the palette. Note: This enhancement requires a 1MB expanded rom. I have successfully hacked the font loading routines, and set the stage for a 2-bit font-set. Here’s a litany of what I’ve changed. Keep in mind, this requires an expanded font-set in 0×8010-0x880f (0×800 bytes). 0x7defb: This pointer originally pointed to Page 09, BA00. Pointing to Page 2, Starting at 8000. 0x7deed: Page switch to 02, rather than 09. 0x7c687: Palette swap for status/army/battle screen. Not sure how much more. Other palettes will likely need tweaking. 0x7c3a7: Font data changed slightly when going into status/army/battle screens. This guards against that. For 0×8010-0x880f, go into FCEUX’s PPU with DoaE running, while your party is in the overworld, and copy 0×1000-0x17ff. Paste those bytes directly into the DoaE ROM. What address is the ppu editable for the blue/white mixture? If you bring up the PPU Viewer in FCEUX, you’ll see the palettes at the bottom of the window. Those correspond to PPU Memory addresses 0x3f00-3f1f. You can find the Status/Army/Battle screen palettes in the DoaE ROM at 0x7c687-0x7c696. Each font character is 8×8, and so each is 8 bytes in size. Row 1 is first bit, Row 2 is second, etc. This is found @ 0x27a10, where the first character in the font set is stored in the ROM (zero is char ID #00). I suggest firing up a graphics program (Paint will work fine), create an 8×8 bitmap. Magnify it so you can see all the pixels, and start playing around to see what looks good. When you like it, hex-edit the character, using the graphic you created. Need to figure out something that nobody has figured out yet? Ready to contribute some major information to the DoaE ROM hacking effort? 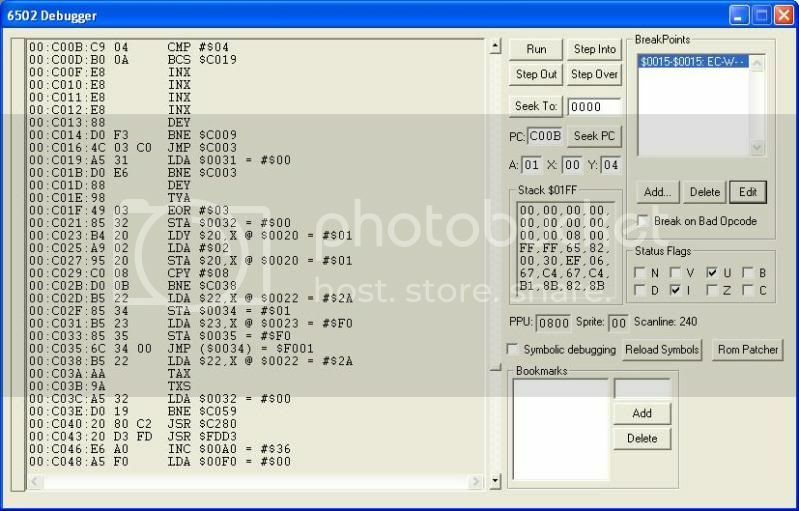 You'll need to read up on 6502 assembly and use a debugger! When you are tracing or debugging, you'll usually see the memory address of the ROM page ($8000-$BFFF) if it's being loaded into memory. You'll have to figure out which ROM page it's loading from (ya…sorry). Mainly the whole approach to debugging is that some value happens (like damage, or some portrait ID that's being loaded, or how long the smoke pot lasts, or whatever). Typically the important value we speak of is stored near the top of the memory stack in the zero page. Usually somewhere in values $0000 to $00FF. You can watch these areas of memory either with "Debug –> Hex Editor –> View –> NES Memory" or "Tools –> Memory Watch". If you can get lucky enough to see the value you're looking for right away, good for you. Then you'll have to test it by switching that value around (if possible). Does it change the behavior? You may need a debugger, the trace logger, or some other option if it is difficult to find your value in memory. Once you find the value in memory and confirm it's the right one, then you have to find out how that value got there. That's where the assembly fun kicks in. Ideally you can use the debugger to trap where the value gets set. You can do this by setting a break point. Add the break point to say…watch $0015 to see when it gets set to "01". You'll need to read up on the assembly links in the "ADDITIONAL READING" section to understand what it's doing. I won't go into that here. Note that you can't really run the Trace Logger for more than a few seconds or you will end up with megabytes and megabytes of trace. 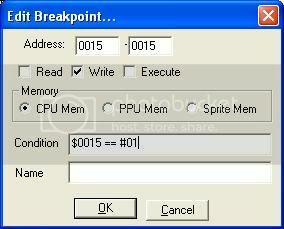 *** Current ROM page is loaded into $8000-$BFFF in memory at any given time. $60CC -> $60CF = ??? $6138 -> $615F = ??? $6190 -> $619B = ??? $65E8 -> $65FF = ??? These memory locations represent which Generals are in the player's party. For example, if $60A8 contains 0x9D, then that means that the General at Party Member Index 0 ($60A8) is Pang Tong (0x9D). $60AF -> $60B3 = Enemies General IDs (Addresses = Party Member Indices) Much in the same way as it is done with the player's party, these memory locations store the General IDs that compose the Enemy's Party. Note that these are stored immediately after the player's party. This means that a Party Member Index of 7 is a valid Party Member Index, in the sense that it will indicate the first Party Member in the Enemy's Party. $6090 -> $6096 = Allies Party Formation (Values = Party Member Indices) These represent the party formation. The value at $6090 indicates which General is in the lead on the party formation. The value at $6096 indicates which General is 7th in the party formation. The values stored in these memory addresses are the Party Member Indices. For example, if $6090 contains 0×03, that means that the first member in the party formation ($6090) is whatever General happens to be in Party Member Index 3 ($60A8 + 03 = $60AB). This indirection can be somewhat confusing at times. The values here are indices into another array, namely ($60A8 -> $60AE), and NOT the actual General IDs. Hopefully, the difference between Party Member Index and Party Formation Index is better understood now. The Party Member Index is an index into ($60A8 -> $60AE), and the Party Formation Index is an index into ($6090 -> $6096), which itself contains the indices into ($60A8 -> $60AE). $6097 -> $609B = Allies Party Formation 2 (Values = Party Member Indices) This is identical to the above, except that this array is used whenever we are in battle. If, for example, the player's first 2 Generals were killed, and the player has a full party of 7 Generals, then the Party Members in battle will include the Party Members at the end of the party formation. Using this second, temporary array in battle simply makes calculations easier. $6222 = #$00 <– Cheng Nei, Ji Rou/Guard, Wuo Jian, or Shui Jian on? $6224 = #$00 <– Ce Mian on? $6226 = #$00 <– Ji Main on? $6228 = #$00 <– Yi Xin on? $622A = #$00 <– Li Jian on? $622C = #$00 <– Qi Shou on? $622E = #$00 <– Bei Ji on? $6223 = #$00 <– Cheng Nei, Ji Rou/Guard, Wuo Jian, or Shui Jian on? $6225 = #$00 <– Ce Mian on? $6227 = #$00 <– Ji Mian on? $6229 = #$00 <– Yi Xin on? $622B = #$00 <– Li Jian on? $622D = #$00 <– Qi Shou on? $622F = #$00 <– Bei Ji on? Another interesting piece is that if the enemy successfully uses Jie Ce/Negate it zeroes out all the ally statuses and if an ally successfully uses Jie Ce/Negate it zeroes out all the enemy statuses.